Facebook is the most popular social networking site. The popularity of one’s Facebook profile is counted by the number of friends he/she has. When someone send us friend request, we get a notification and we can accept or reject it. But we don’t get any notification if someone unfriend us or cancel his/her account. So how do we get to know who unfriended us on Facebook? One way to find out who unfriended us on Facebook is to go through our friend list and find the missing friends but it becomes really tough job if we have 100+ friends. It is really difficult task to check each and every single friend. The other solution is easy. 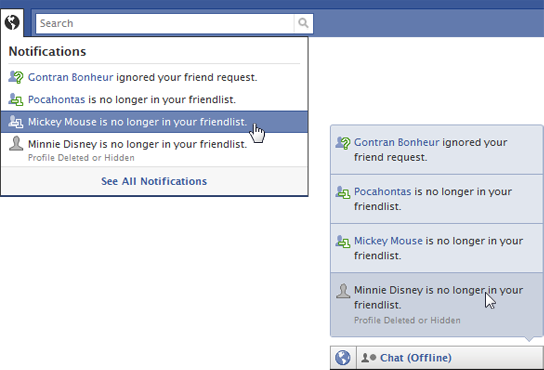 Unfriend finder is the user script which let you find who unfriended you on Facebook. Once you install the script it will start notifying you. When someone removes you or deactivates its account, you’ll be able to know easily with notifications. It will also help you to find who has not yet accepted your friend request. Facebook let you know who you accept friend request, but not those who cancel them. It will give you the ability to find who ignore you on Facebook. You can install this script on your favorite browser Firefox, Chrome, Safari or Opera. You can follow the instructions given here to install it. Simple chose your favorite browser and follow the instructions. That’s a good tip! Thanks for the share Simran. ya nice post i will try it !!!!!!!!!! Awesome tool, I’m using it now. An excellent script for sick fans of Facebook! nice share mate.. facebook should officially install some similar codes, will be benefited for everyone..
that’s nice one. this is very important for facebook lovers with 100 of friend’s to left your support. Oh, this is a great tool. I get quite a bit of friends everyday on Facebook, but there are also a number of them unfriend me… need to find out those and treat them a cup of Starbucks to get them back I guess! How do you react with someone who unfriended you? But with this tool I can just leave them and don’t mind them at all. Thanks for this help,quite useful. Nice trick. For sure you want to know why they unfriend you but it mostly happen for people you dont know. Im still looking for the trick to see you profile visitors too!! I’ll try this one. Thanks for sharing. I was really in search of this. Facebook should provide this feature in itself. It will be a fun to know who unfriended me. Thanks for sharing. Yes I dont like it when the site says so and so accepted your friends request and you did’nt send one to them.then you feel bad and keep them as a friend ant way, at least for a while.